Saturday, June 1, 2019 is the Plumas-Sierra 4-H Color Me Green 5k Fun Run at the Fairgrounds in Quincy. Please join us for this fun and colorful event! Registration begins at 7:45 am. Race starts at 8 am. Registration must be completed online. Click here to register. For questions please contact the UCCE office at (530) 283-6270. UC Cooperative Extension Livestock and Natural Resources Advisor Tracy Schohr has develop a resource page for livestock producers impacted by the Camp Fire. The page includes information on Farm Service Agency programs, estimating livestock forage loss, livestock drinking water quality are more. Click here to learn more. 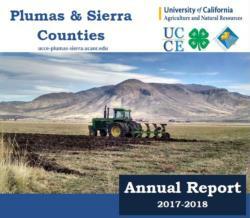 The UCCE Plumas-Sierra team is excited to share our 2017-2018 annual report. Click here, to learn more about the extension programs and research projects underway in our local community.